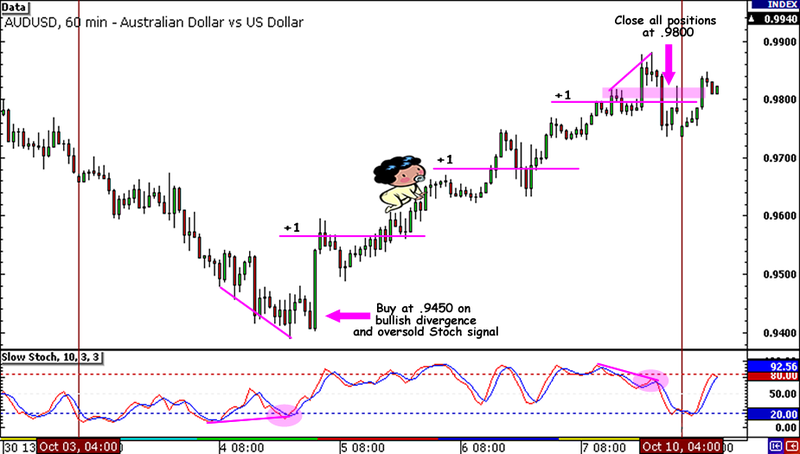 Comdoll Weekly Replay (October 3-7, 2011): 710-pip AUD/USD Setup! The NFP week has always been a big mover for the comdolls, and last week was no exception! Looking at the 1-hour chart AUD/USD last week, I now see that there was a simple setup that popped up late Tuesday. At the time, the pair was encountering support at the .9400 area just when a bullish divergence and an oversold Stochastic signal were also lining up to support a long AUD trade. If we had gone long at .9450, used a 115/1/1 STA and then closed all positions at .9800 by the end of the week, we could’ve gotten a total of 710 pips or a 6.17:1 reward-to-risk trade! For those who are wondering, .9800 looks like a good area to close all positions not only because it was around the time when Fitch downgraded Italy and Spain, but there was also a bearish divergence and an overbought Stochastic signal to support a bearish stance. A 710-pip trade opportunity! And to think that was trading a NZD/USD Fib retracement setup at the time. Well, this just goes to show that I should get over my distress over my AUD/USD soon so I wouldn’t miss fantastic setups like this one. So there you have it, friends! Any questions for me on this setup or on any trading strategies? Give me a holler! Hooray for the comdoll gang! 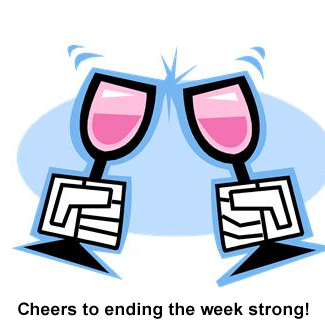 They all finished the week higher against the Greenback! Are they all in for more gains or did we just witness a huge retracement? Australia started the week on a strong note as it released a couple of better than expected economic reports on Tuesday. On that day, Australia reported that building approvals jumped by 11.4% in August while their trade balance widened to a surplus of 3.10 billion AUD. Despite these strong reports, the RBA statement a few hours later came in much more dovish than expected. Although the central bank kept rates on hold at 4.75%, Governor Stevens suggested that they were open for a rate cut. *Gasp* That was enough to push AUD/USD to the .9400 area! When Fed head Ben Bernanke also hinted that the U.S. central bank was considering further easing, the Aussie, along with its comdoll buddies, were able to take advantage of the dollar selloff that followed. Trust Big Ben to turn the tables around, huh? Meanwhile, data from Canada has been mixed as it printed a whopping 10.4% decline in building approvals but made up for it with a big improvement in its Ivey PMI. Employment data also came in strong, with their unemployment rate dropping from 7.3% to 7.1% in September. New Zealand didn’t release any big reports during the week, save for its NZIER business confidence which dipped from 27 to 25 in the third quarter. Still, NZD/USD managed to end the week on a good note as it climbed to a high of .7798. Of course the NFP report released on the last day of the week was part of the reason why the comdolls ended the week with a bang. The U.S. jobs report beat expectations, allowing for an extra kick of risk appetite before the end of the trading week.